Several months ago, our good friend Dana (her adorable husky Nikolai is featured in this picture of us) asked us if we took requests; she wanted us to make jambalaya. At the time, jambalaya seemed to be more of a cold-weather dish, and we were worried it might not fit in with grilling-and-salads season. However, yesterday was Dana's birthday, so we decided to finally fulfill her request and turn up the A/C to pretend it was a chilly evening on the bayou. Our jambalaya turned out tasty enough to enjoy no matter the weather, especially if you like slow-burning spicy food. Most recipes we looked at used chicken stock. Since we didn't have any on hand, we improvised by using the shrimp peels and heads to make a quick stock that kept the jambalaya light and accentuated the shellfish flavor (the leftover stock went into this morning's ramen). This meant buying unpeeled, head-on shrimp and cleaning (peeling, deveining, decapitating, de-tailing) them ourselves, which sounds like a lot of work but is actually strangely satisfying, if a little gruesome. The cleanest way to devein shrimp is to do it in a bowl of water so that the gritty digestive tract (i.e. the vein) sort of floats away. One caveat: don't squeeze too hard when you take off the heads, unless you want orange shrimp brains under your fingernails. 1. Peel and devein shrimp. Remove heads and tails. Transfer shells, heads, and tails to a large saucepan. 2. Strain tomatoes with a fine mesh strainer. Add tomato liquid to shrimp trimmings in saucepan. Keep half of strained tomatoes for Step 8 and discard or refrigerate the rest. 3. Add enough cool water to saucepan to submerge shrimp. Bring to a boil over high heat. Reduce heat to medium-low and simmer for 20 minutes. Strain with a fine mesh strainer and set aside. 4. Meanwhile, heat oil in skillet over high heat until smoking. Trim any large globs of fat from chicken thighs. Pat dry with paper towels and season lightly on both sides with salt and pepper. Add thighs to skillet and sear until lightly browned on both sides, about 2 minutes per side. Transfer to a plate and set aside. 5. Reduce heat to medium-high. Add andouille and sauté until sausage has browned and fat has rendered, about 7 minutes. Transfer to a plate with a slotted spoon and set aside. 6. Add bell pepper, onion, celery, scallion whites, bay leaves, thyme, and butter to skillet. Add 1/4 teaspoon salt and lower heat to medium. Sauté until vegetables are soft and translucent, about 10 minutes. Add garlic and sauté until no longer raw, about 1 minute. 7. Rinse rice in cool water until water runs clear-ish to get rid of excess starch. Drain rice. Add to skillet and stir until every grain is coated with fat, about 30 seconds. 8. Add reserved strained tomatoes, browned andouille along with any accumulated juices, 3 cups shrimp stock, 1/2 teaspoon salt, cayenne, 4 shakes Worcestershire, and 4 shakes Tabasco. Stir. Raise heat to medium-high and bring to a light boil. Reduce heat to medium-low, cover skillet, and steam for 15 minutes. 9. Place chicken thighs on top of rice, along with any accumulated juices. Cover skillet and steam for 5 minutes. Flip thighs. Cover skillet and steam until thighs are just cooked through (the juices will run clear), about 5 minutes. Transfer thighs to a plate and set aside. 10. 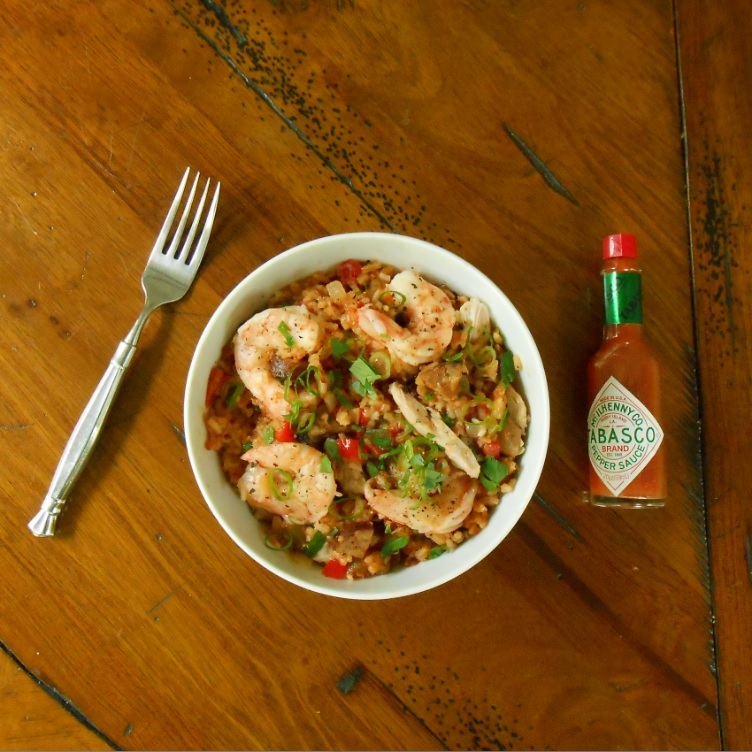 Arrange shrimp on top of rice in a single layer. Cover skillet and steam for 5 minutes. Flip shrimp. Cover skillet and steam until shrimp is just cooked through (the centers will be slightly translucent and lukewarm to the touch), about 2 minutes. 11. While the shrimp cooks, tear chicken thighs into bite-sized pieces. Once the shrimp is cooked, add shredded chicken, scallion greens, and parsley to skillet. Turn off heat and stir to combine all ingredients and dislodge any bits of crispy rice from the bottom of the pan. Taste for seasoning and add more Worcestershire and Tabasco if desired. 12. We don't have any fancy serving suggestions for this dish. Scoop from pot, plop in bowl.